Congolese have welcomed President Joseph Kabila's promise to weed out armed groups in the country before the end of this year. 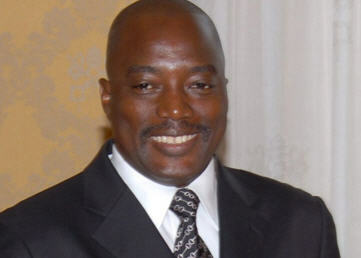 In a televised address to the nation's to mark the beginning of the New Year, President Kabila vowed to bring peace to the country before the end of 2009. Congolese had been frustrated with the government for its inability to decisively deal with rebels loyal to renegade army general Laurent Nkunda and other armed groups operating in the country. Scores of people have died and thousands displaced from clashes between the rebels and the Congolese national army. Julius Musafari is a resident of Congo's restive north Kivu province. He tells reporter Peter Clottey that Congolese are hopeful that President Kabila would keep his promise. "Following the president's announcement, the reaction of Congolese, especially here in Goma is positive due to the fact that these people have been expecting peace since long. And the message of the president was really helpful," Musafari pointed out. He said despite the president's promise to restore stability in Congo's restive region, it would be a herculean task to accomplish. "Bringing peace in the eastern part of Congo is an intricate issue. But like you know, what we are appreciating is the relations or the diplomatic relations between Congo and Rwanda, which is going on a good stead. This is what I can so far tell you," he said. Musafari said there seems to be hope in the peace negotiations between the government and rebels loyal to renegade army general Laurent Nkunda. "For the time being we are on the stage of peace talks and these peace talks are going to resume on the seventh of this month. However, the army is well prepared as we can see and I think that they are ready to deal with any eventuality," Musafari noted. He said there is a concerted effort by countries in the sub-region to rid Uganda rebels of the Lord's Resistance Army from the country. "You know that military operation is going on and this military operation is being carried out by the Uganda army, the DRC army and also the Sudan army. So, they are trying to track down and root out the LRA because the rebels group has been committing acts of terrorism in Congo. And we know that after the military operation we are going to get some amount of peace in that part of the country," he said. Musafari said Congolese are hopeful President Kabila will keep his promise. "Our President Joseph Kabila was elected by we the locals and we are still believing in his power because he always promises and he meets his promises. So, we are believing that peace is going to come back in the eastern part of the DRC," Musafari pointed out. Meanwhile talks between rebels loyal to renegade army general Laurent Nkunda and the government aimed to resolve instability in the restive North Kivu province is set to continue.